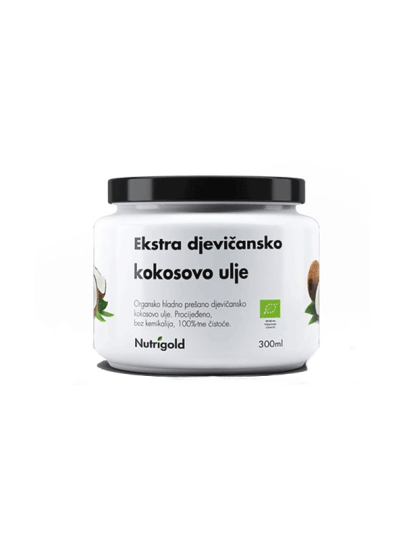 Extra virgin coconut oil 300ml is obtained by cold pressing from fresh and ripe coconut fruit, which distinguishes it from the RBD oil that has been processed. The key difference is that extra virgin coconut oil is not subjected to high temperatures or chemical processes. A unique combination of fatty acids, lauric and capricilized, is characterized by a powerful antibacterial and antiviral product. However, what distinguishes coconut oil from all other oils is that instead of conventional long-chain fatty acids, coconut oil has a high proportion of medium acids for which it occupies a high place on a healthy diet scale.